I stopped in at the new FUEL Cafe south location on 5th Street and saw a donation box for the 88Nine Radio Milwaukee Second Annual No Empty Backpacks School Supplies Drive to benefit Milwaukee Public Schools students. 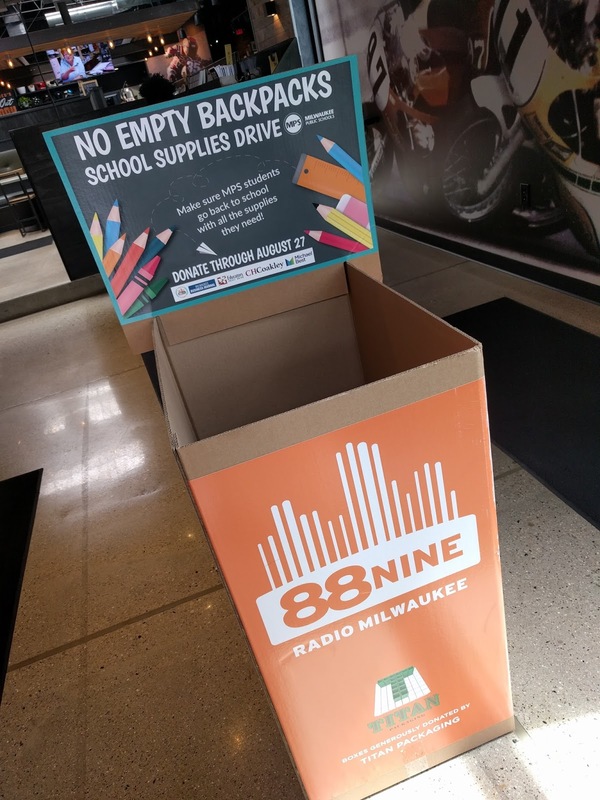 In a partnership with Milwaukee Business Journal for the month of August, donation bins will be at Radio Milwaukee in Walker’s Point, Milwaukee Business Journal, BelAir Cantina locations and select Educators Credit Union locations. FUEL isn't listed, but as a sister restaurant to BelAir they apparently are participating as well. No Empty Backpacks School Supplies Drive is presented by 88Nine and Milwaukee Business Journal with support from Michael Best & Friedrich, CH Coakley, Educators Credit Union. You can view the School Supplies Amazon Wish List here. So, shop, then stop - at one of the locations listed. If you need a cup of Joe on the way to work downtown, check out FUEL, or after work for some great food.